When you are just starting out in your wedding business it’s easy to Yes to everyone. You worry about finding clients, you don’t know if enquiries will keep coming in and you are scared to turn away business. As a result, countless new businesses end up with too many clients. 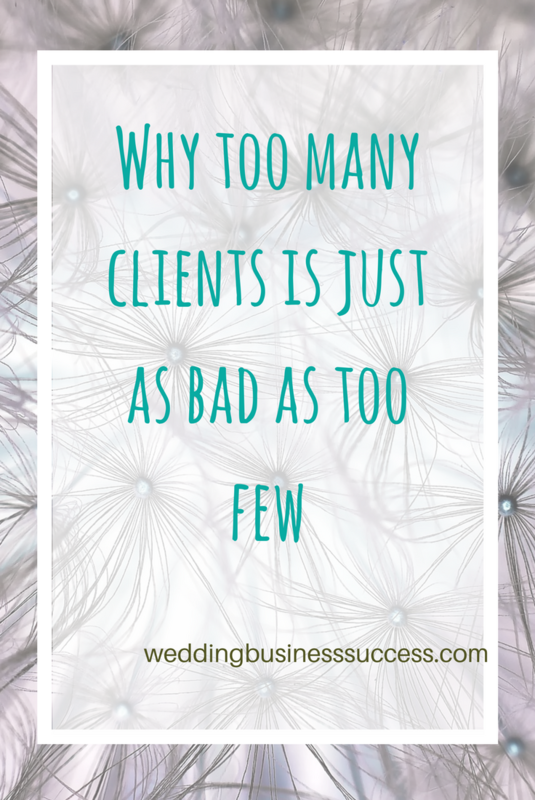 And when you have too many clients you quickly become overwhelmed. Your work suffers, service levels slip and you become completely stressed out. All of which can have a lasting negative impact. Customers leaving poor reviews online. You stop enjoying what you do. Or worse – your health suffers and you can’t carry on. Too many clients can kill a business just as effectively as too few. Fortunately, it’s fixable. Just as long as you identify the problem and act quickly. The key thing is to recognise you’ve taken on too much before you get completely overwhelmed. It’s easy when you are starting out to underestimate the time it will take for each client. Whether it’s planning and styling a wedding, editing photographs, making stationery. Then as the wedding season gets into full swing you realise you’ve over committed. Stop taking new bookings. Just tell people you’re fully booked. Even if the booking is for months ahead, make sure you’ve sorted out your long term plans (and especially your pricing) before you say yes. This applies to existing bookings too. Say no to all those little extras and last minute changes that creep in until you’ve got things under control. It’s hard when you are overwhelmed but get off the treadmill for a couple of hours and really look at how you are working. Are there things you could do more efficiently? What are the really time-consuming steps? Can you improve your productivity without cutting corners? Now look for things you can hand over to someone else to free up your time. Can your family help out? Is it time to take on a virtual assistant to look after your admin? Look at household tasks as well as work tasks. These can often be quicker and easier to outsource like getting a cleaner or sending out your ironing. Got things under some sort of control? It’s time to make sure it doesn’t happen again. The first thing to look at is your pricing. Now you have a realistic idea of how long things take, make sure you are charging enough. Increasing prices may reduce your number of bookings, but as you earn more per client you’ll be able to earn more for less work. Work out who your ideal client really is. Too many businesses try to appeal to everyone. Identify the type of couple who really loves your work and is prepared to pay what it’s worth to get it. Then focus on attracting them. You’ll enjoy your work much more too. This is SO important. The business won’t survive without you – so look after yourself. Schedule days off. Make time for family, exercise and eating properly. With these in place, you’ll be set up for long term success. PS: You can learn more about pricing and targeting your ideal client in the Marketing Mastery course. Very true. And it doesn’t apply to just wedding businesses, but all businesses – especially to those where you cannot control the orders (e.g if you sell online and there isn’t a specified limit to the sales). While many people think that this is a ‘good’ problem to have, I have always thought it is as bad as not having any customers if you cannot deliver to the standard and time promised!